In the past I recommended the 7 train as the best way to get to Citi Field, but most people wouldn’t argue that the 7 train doesn’t offer the smoothest ride or the most pleasant scenery. It’s not as bad as John Rocker was quoted as saying, but it does stop a lot and moves fairly slowly. Immortalized by a Braves reliever of all people. After reading a few glowing opinions of people who had taken the Long Island Rail Road to a Mets game, I gave it a try after my last visit to Citi Field; hopping on after the game to get back to Penn Station. I agreed with the rest at the time: I would never go back to the 7 to get to Citi Field. 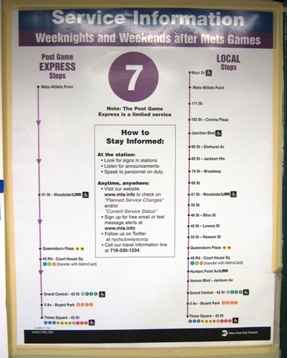 OK I confess, I still use the 7 at times, because I’m a New Jersey-dwelling tightwad. More about that in a future post. But I far prefer the LIRR. Yes, the LIRR costs a few bucks more; the ride is $8 at peak times (although I’m not sure yet what qualifies as peak time, since the train only stops at Citi Field on game days) and $6 at other times; I’m pretty sure I paid the $6 in my trip. The 7 to Penn Station is $2.75 as of this writing. 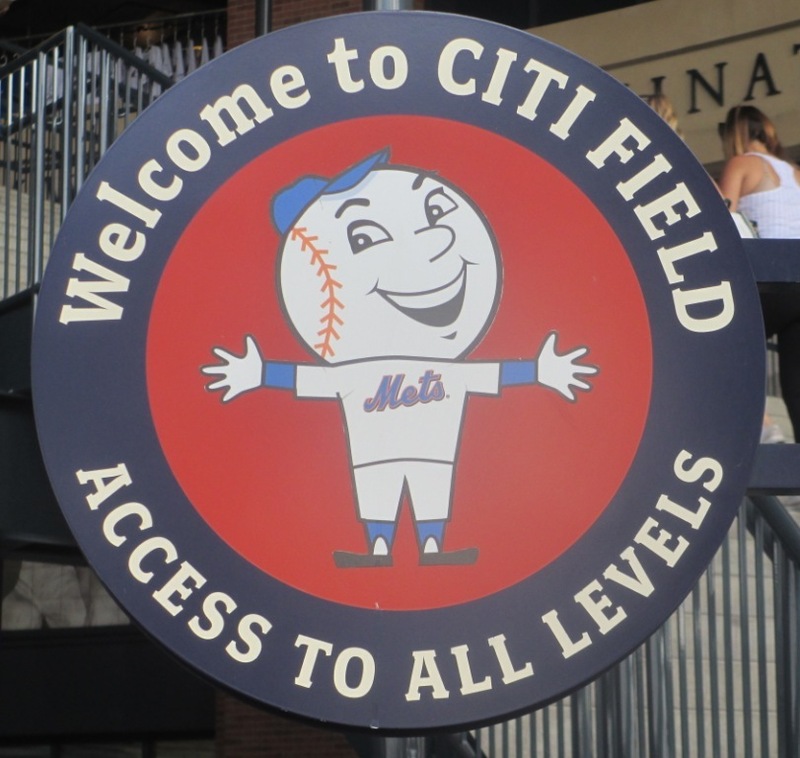 In case you don’t know who plays at Citi Field, they’ve put up a helpful sign. Squint a little bit and you can’t miss it. 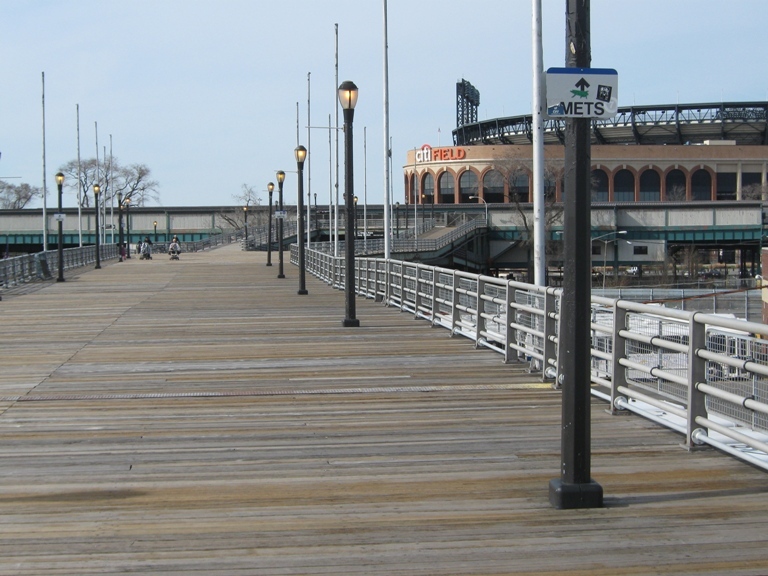 If you land the $6 fare especially, it is the best way to get to Citi Field for two reasons. The first is seat comfort. These are long commuter trains and being the more expensive of the two will see fewer passengers, so you are far more likely to land a seat on the LIRR. And the seats are larger and much more comfortable. The second is speed. It’s only two stops on the way back to Penn Station (where I arrive from NJ Transit), as opposed to thirteen if you use the 7-E combination. Not to mention avoiding a transfer…and a wait for another train. 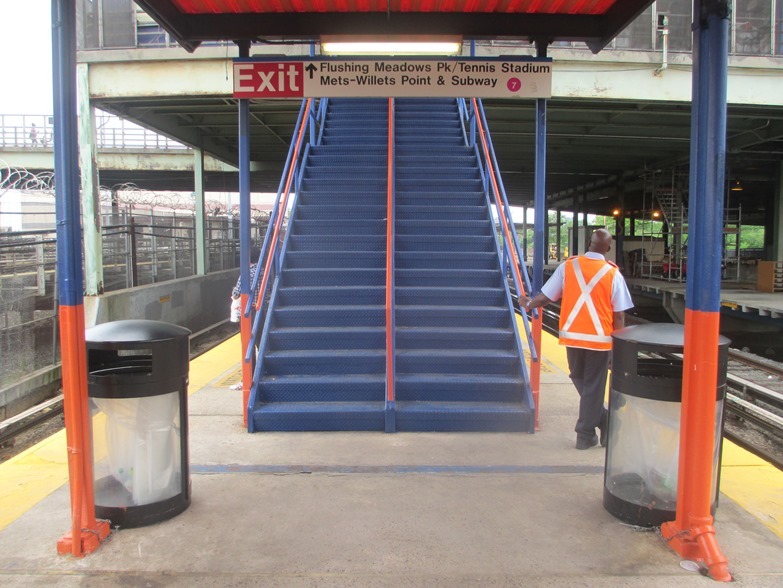 The 7 Line has a Mets Express with fewer stops, but you can’t transfer to the E from it—this requires a transfer to the 1, 2, or 3 or a walk from Times Square. The ride takes about 35 minutes as opposed to 15 for the LIRR, but that is a world of difference. 35 minutes standing on a screechy train seems like much more than twice the time compared to sitting on a quieter train. Coming from New Jersey or Manhattan at least, I recommend the 7 if you’re thrifty and definitely recommend it over driving to Citi Field. But if you are willing to pay a few extra bucks to not have to use a railing to balance your momentum 13 times, use the LIRR. It’s well worth the extra few bucks. As a South Jersey native, it’s my favorite way to get to Citi Field.